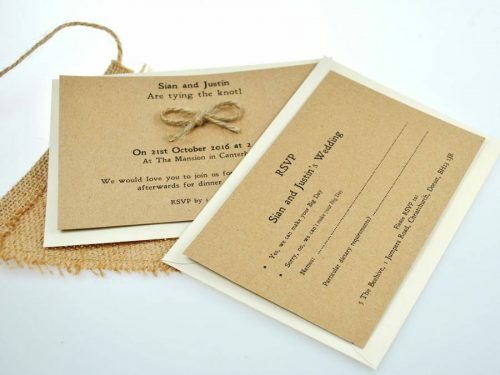 Very eco-friendly Tie the Knot invite set, consisting of a sturdy A6 invitation printed on recycled Kraft card, with a quirky handmade jute knot attached. The RSVP is also A6 size and made from the same recycled Kraft card. 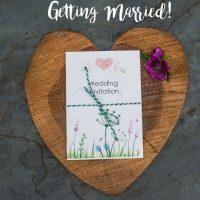 Envelopes are provided for the invite and the RSVP – we don’t need to add really that they are recycled envelopes, do we! They will be manilla or ivory, depending on what is in stock when you order. The package is secured with some Baker’s twine. Please email the invitation wording after you have ordered and we will send back a proof for approval before printing. We have seed packet wedding favours. to match this invite set, and we can also create for you anything else to match that you might need! Just drop us an email. The perfect stationery range to add some eco-friendliness to your wedding day!